Checking your blood glucose can be a tiresome (but necessary) part of living with diabetes. Testing your blood glucose using a glucometer gives you snapshots of your blood glucose profile at isolated times during the day. Continuous glucose monitors, on the other hand, allow you to see what your blood glucose is doing throughout the day, by taking measurements approximately every 5 minutes. In the next few years, everyone will be able to use continuous glucose monitors to track their blood glucose. Athletes, professionals, coaches, people living with prediabetes and type 2 diabetes, coaches and medical professionals will soon have CGM technology at their fingertips. I wrote an article about this for KQED a few years ago, so read it to gain more appreciation for the importance of CGM technology for non-diabetic individuals. This is great news, because tracking your blood glucose is a powerful way to gain insight into how your food, exercise and stress affect you in ways that were previously invisible. Verily (Google's life science team) and Dexcom have teamed up to develop a miniature continuous glucose monitor (CGM) to help people with type 2 diabetes measure blood glucose continuously. Dexcom manufactures CGMs for people with type 1 diabetes, however they are generally not available to patients with prediabetes or type 2 diabetes. This partnership is focused on minimizing both the cost and the size of the components. And it goes without saying that these sensors would be fully cloud-compatible, for all tech nerds to enjoy. Sano has developed a biometric sensor in a low-profile patch that is designed to measure your blood glucose and relay that information to your mobile phone. The patch measures interstitial fluid in your skin’s top layer to provide real-time, continuous glucose monitoring. Google is actively developing a contact lens with embedded microchips and miniaturized electronics that would measure glucose in your eye fluid, and wirelessly send the data to your mobile device. This technology eliminates the need to wear a patch on your skin, and instead utilizes sophisticated technology in a contact lens which eliminates the need for blood from a finger stick. Who knew that your tears had such valuable information? Apple is apparently working on a "top secret" project, led by a group of biomedical engineers. Some believe that they are developing optical sensors which can detect glucose by shining light through your skin. It is hard to get any information about Apple's CGM technology, so perhaps we'll just expect them to release another device with space age technology, as always. The World Global Network developed a wristband, called Helo, that can be worn 24-7 and is a real-time health monitoring device that measures your vitals. In addition to your blood glucose, the Helo device measures your emotions, fatigue, sleep quality, exercise, blood pressure, heart rate and ECG, and is capable of wirelessly alerting a family member or friend about a health emergency. The company GlucoWise﻿ is developing a sensor that gently squeezes either the skin between your thumb and pointer, or the skin on your earlobe. The device then wirelessly relays your blood glucose value to your mobile device, and stores all your data in the cloud. According to the company, "It will take no more than 10 seconds to provide a simple, fast and highly discrete testing experience." 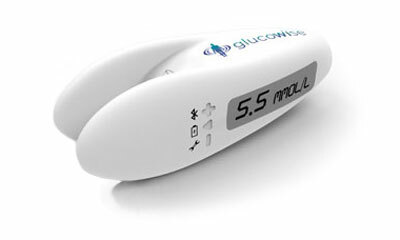 GlucoTrack has developed a device that is approved in Italy and Spain; it is not approved in the United Kingdom, France, Germany or the United States. The device is bulky and slightly cumbersome, and measures blood glucose using a device that clips to your ear. Clip the device to your ear, sit back and wait as it measures your blood glucose non-invasively. In addition, the device provides you with an estimated A1c value, helpful for giving an indication of your 3-month blood glucose average. The Alertgy CGM is a band that you wear on your wrist that monitors your blood glucose and wirelessly transmits the result to your smartphone. The band is waterproof, hypoallergenic, and can be worn 24 hours a day. The company claims that the device will be available in 2020, and they are currently in the prototyping phase. The wristband leverages technology developed for military application. Share this article on social media and leave a comment below, and you will be entered in a drawing to receive 1 year of access to Nutrino Premium, valued at $79. We have partnered with Nutrino, a mobile app technology that allows you to learn how your food affects your blood glucose. We interviewed the Chief Scientific Officer Yaron Hadad in the Mastering Diabetes Online Summit back in February 2017, and he explained how their app uses machine learning algorithms to understand how individual foods affect your blood glucose. When I saw their technology, I was BLOWN away. Their app is also extremely useful for finding plant-friendly places to eat, for discovering plant-friendly recipes and for logging your food intake effortlessly. Share this article on social media and leave a comment below, and you will be entered in a drawing to receive 1 year of access to Nutrino Premium, valued at $40.